If you are tired of the Mediterranean with its overcrowded beaches in the summer, overpriced hotels, restaurants and the traffic jams of the French Riviera, there are other regions in France where you can enjoy beautiful landscapes, eat great food at reasonable prices and still find empty beaches…..on the other side of the country! Brittany is one of them, and clearly my favourite. The French have traditional jokes and clichés about this area. One of them is the rainy weather. Okay, let’s be honest about it, given its geographical location, sunshine is not guaranteed, but according to the statistics it rains as often as in Paris (i.e. 170 days-a-year on average). Bretons often say that ‘It only rains on the idiots’, meaning ‘You like it as it is or you leave it’. The truth is that the climate is temperate and the temperatures are never extreme. And you can enjoy completely sunny days without the usual drizzle, known locally as ‘le crachin breton’. Let me take you for a little trip along the northern coast of the peninsula from Mont St Michel to the surprising Ile de Bréhat. It is only a part of Brittany but there is so much to discover. Actually ‘Le Mont Saint-Michel’ is officially in Normandy and marks the limit between both regions. There has always been a bit of rivalry between Normans and Bretons, as the local river Couesnon, setting the border, used to have a different course that located the Mount in Brittany. Added to the UNESCO list of World Heritage sites in 1979, it is an outstanding cultural, religious and historical site. 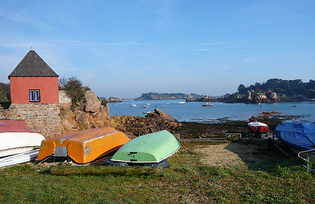 For running enthusiasts, there is even a marathon which takes place each May, following the seashore from Cancale to Le Mont. It is probably the only race where you can see the finish from the start, and enjoy an amazing view for over 42 kilometres. Once you are done with the marathon, you can go back to Cancale and enjoy the local specialty: seafood. The fishing tradition of the city goes back many years to the time when fishermen used to leave Cancale for 6-8 months to go cod fishing in Newfoundland, bringing their catch back to Brittany to sell it. 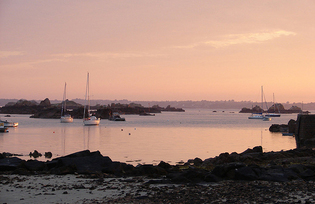 Nowadays, Cancale is known as the ‘oyster-city’ of Brittany. Heading west, the city of Saint Malo became famous for being the home of privateers and corsairs. Although the city was largely destroyed during the second world war, the ‘Remparts’, the walled city and the Château were spared and they are definitely worth seeing. Further west, you will cross the Rance river on the tidal power plant, which is a unique example of its kind. On the other side, Dinard is considered the ‘Cannes’ of Brittany, its shore lined with beautiful villas built during the 19th century. At that time, the place attracted many British visitors who contributed to the town’s success as a tourist destination. They still haven’t entirely deserted the place for the French Riviera, and there is even a British Film festival which takes place every October. Even nowadays, Dinard is very popular with the Parisian and Breton ‘bourgeoisie’ and is a trendy place to stay during summer. For golf addicts, the local ‘Golf de Dinard’ situated along the sea is known as one of the oldest courses in France and considered beautiful but tricky especially on windy days. 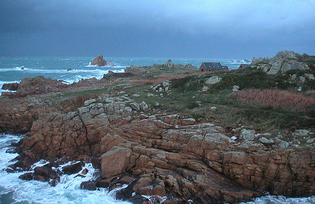 With the wind in our faces we keep going west to reach the bay of Saint Brieuc, in the ‘Côtes d’Armor’ department. Apart from the St Etienne cathedral, built on XIIIth century, the city centre does not have much of interest. There is more to see on the sea shore, and more local food to be savoured, as St Brieuc’s harbour is the country’s major producer of scallops with 6500 tons produced yearly. But you mustn’t ask for a local wine to go with them, as there are no local wines! In terms of beverages, Breton cider is pretty good, as are the local beers like Coreff; you can also try new beer flavours including honey, buckwheat or algae! You might also be surprised to be served a local ‘Breizh cola’ instead of your coke. Bretons are quite proud of their Celtic culture and the bilingual road signs are just the most visible part of it. Luckily, you won’t have to pay on the local motorways; since the time of Anne de Bretagne, the Duchess of Brittany (1477-1514), there have been no road tolls in Brittany. Driving up north, you will reach a charming harbour called Paimpol where fisherman used to leave for long trips to Iceland, inspiring local novelist Pierre Loti who wrote a beautiful book ‘An Iceland Fisherman’ in the 19th century. 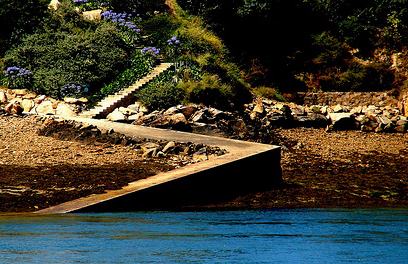 You then reach the northern point of the region, where you leave your car and take a short boat trip to Bréhat. You are not ‘on the mainland’ anymore. The island is 5-kilometres long, with no cars, a few tractors for transporting goods and food and 400 souls in the winter. The whole archipelago is made up of dozens of small islands; one of them is actually for sale (for the modest price of €3 million). 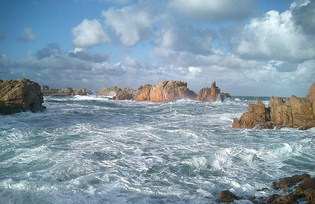 The pink granite coast and its Mediterranean vegetation make it look like Corsica although water temperatures are just slightly lower than the Mediterranean (around 18°C) and you need to wear a jumper to enjoy having dinner outside. The tides are so extreme that the seascape changes all day long and you can walk miles along the seabed when the tide goes out. Transport is limited to walking or bike-riding. Giving up the car changes your holidays entirely. Of course, it gets busy in the summer with Parisian families settling in for their holidays, but not like in other parts of the country in August. Many locals do visit the island on a day-trip; however you will enjoy it most if you stay for a night or more. My favourite moment is the end of afternoon when the day-trippers are gone, or anytime of the day in the non-tourist season. Walking along the shore, admiring the colourful sunset on the archipelago, listening to the silence or the roaring sea, well.. it is difficult to describe. You just have to go there. C’est mourir à ce qu’on aime : …To die to what we love. Que l’on sème à chaque adieu !